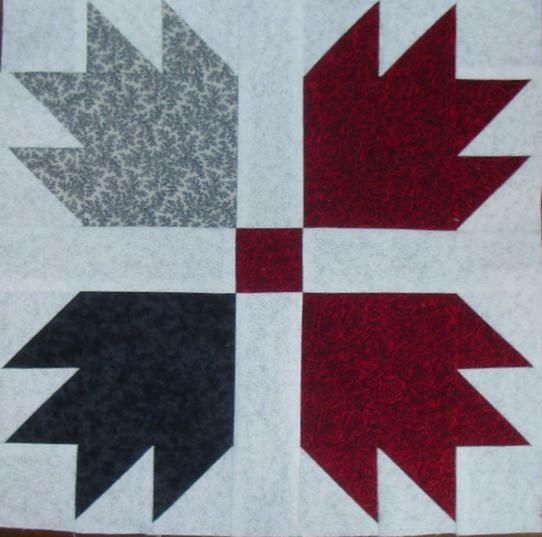 First we will make the diagonal half squares (DHS) or half square triangles, which ever you prefer calling them. You can use which ever technique you want to make them, but this is my favorite. First, mark your lightest squares diagonally through the center. (This will be a cutting line when you are finished.) 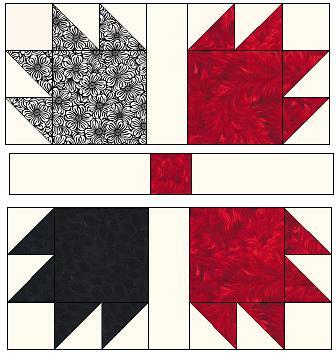 Place a color or print 2 5/8 inch square, right sides together with the 2 5/8 inch marked square. Sew on either side of the drawn line, exactly 1/4 inch from the first line. Cut this square in half on the cutting line. Press them all to the darkest fabric. You will now have two diagonal half-squares, which should measure exactly 2 1/4 inches. Repeat with the remaining 2 5/8 inch squares. Pay close attention to this step which will use up all of the DHSs you just made. These do not go in the same direction and it will make a big difference when you sew them together. You need a pair from each print or color with white-on-white pointing up left. And a pair from each print or color with white-on-white pointing up right. Add a 2 1/4 inch white-on-white square to the set with white-on-white pointing up right. Repeat with all of your DHS pairs with white-on-white pointing up right. 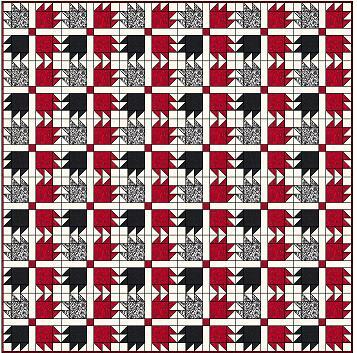 Sew the remaining DHSs which are going in the other direction to the matching 4 inch square like this. Complete the paw by sewing a white square and two DHSs strip to the top as shown here. This finished unit should be 5 3/4 inches square. Now sew a white strip between the units you just made. Notice how those units are turned, putting the large squares in the center. Sew together the middle row. Your Cat's Paw block should measure 12 1/2 inches.